It is a common misconception that you don’t need a Will until you reach Later Life, and we want to dispel that myth forever! Making a Will should be as familiar and fundamental as taking out home, car or life insurance. Whether it is making a Will, putting a Power of Attorney into place, dealing with the Probate of a loved one’s estate or setting up a Trust. No matter how simple or complex, our aim is to help you understand the importance of planning for your future and the future of your loved ones! There are key stages when you should think even more about making a Will. This is often when your circumstances change and a certain amount of planning can help to protect you and your family from any potential stress. Christine Thornley, an very recent Mother herself, has had years of experience working with clients who have believed their assets will be split in a certain way and that specific people will be allowed to look after their welfare. However this is not always the case. By Acting On It, you can give you and your family total peace of mind that the necessary things are in place should you pass away or be affected by an illness or loss in the family. Have a look at our dedicated Act On It Facebook page for news, updates and shares. None of the above, but I want to find out more general information about planning ahead. Did you know, half of the current population in the UK have never made a Will. From a recent survey we found…. 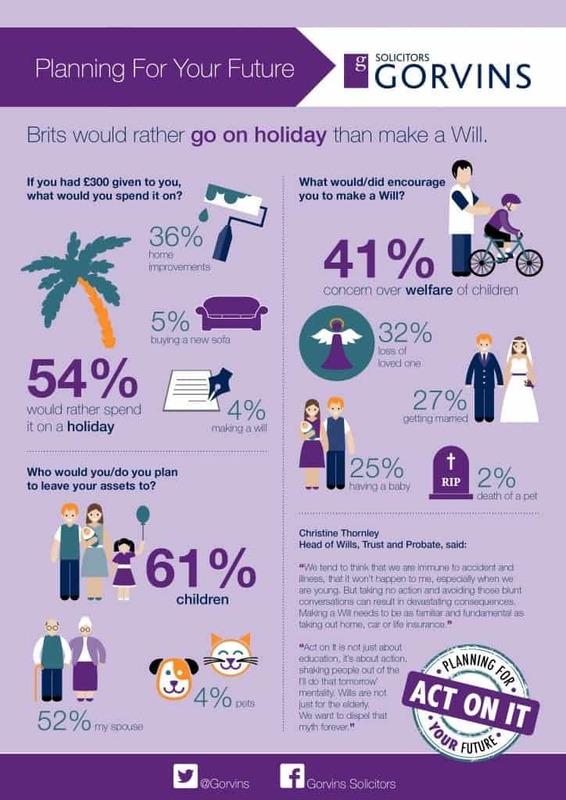 54% of people in the UK would rather spend money on a holiday than on making a Will! This wasn’t to say that the rest would make a Will, 36% said they would spend it on Home Improvements and 5% on a new sofa. This leaves ONLY 4% of the UK’s population choosing to make a Will over the other three options!